I couldn’t have been older than eight. My mother, my brother, and I were on summer vacation in Bombay in my grandparents’ apartment, and my aunt and two cousins had just flown in. We were splayed around the bedroom, on the bed and on mattresses on the floor. I, being the baby of the family (a title that time shows I might never live down), was in the center of the bed, as that was spatially economical. We’d already had our usual hour or three of unscheduled catching up, and by now we’d turned out the lights so we could get some sleep before waking up early in the morning to enjoy the day together. Maybe it was the excitement of my aunt’s family there that kept me awake, or maybe it was the Ferrero Rochers. (We didn’t buy much chocolate back home in the Omani capital of Muscat, but my mother and aunt always brought a shoe box full to Bombay to satisfy my grandfather’s sweet tooth, and we younglings greedily picked at it as well.) Whatever it was, I couldn’t sleep, so I thought to pass the time the way I usually did: by imagining a story. Except for the AC providing a heavy white noise, which gave me a blank slate to fill with color, my creativity was limited. I couldn’t very well imagine a personal story, since that would have been an egocentric tale of me triumphing over my elder siblings, cousins included—and with them possibly awake and staring right at me from either side, it was too discomforting to try. The default option was to imagine a story from the Masters of the Universe world, a tale of He-Man fighting Skeletor and other evildoers. But trapped between my brother and cousin, I couldn’t use my body to choreograph He-Man’s sword-slinging action; I thought perhaps the story could start with him being wrapped in chains and contained, like I was, but I couldn’t bring myself to believe that he would ever get captured. So with no way to give my hero the proper story while maintaining the illusion of at least trying to sleep, I turned instead to Voltron. I didn’t hold Voltron to the same perfect standard as I did the perfect He-Man, so I could sink into a story about him without reservations. Voltron: Defender of the Universe was a very different experience for kids growing up in Oman than it was for kids watching the show here in America, mainly because it was broadcast in Arabic. I also did not know Arabic, so to me it was a foreign cartoon in an alternate foreign language. Visually, it was everything an eight-year-old could ask for. 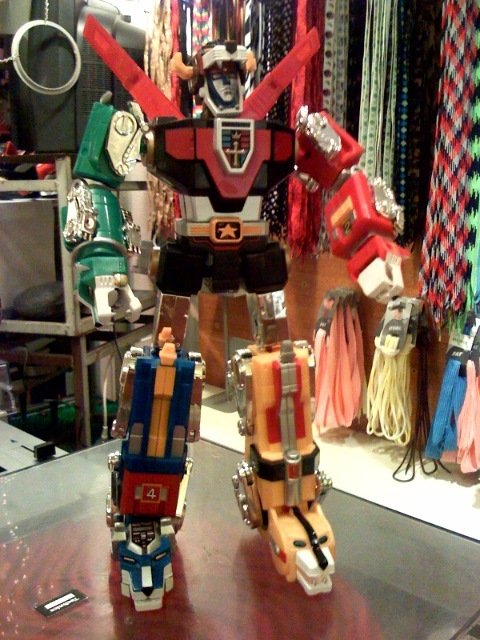 Four giant primary-colored robot cats would join with the limbs of a fifth, larger black cat to become Voltron, the giant man robot with cat-faced hands and feet. In addition, there was a blue-faced evil king who was always stroking a rasping alien cat. I’ve come to know in my adulthood that many two dimensional villains like having a cat to stroke, but this animated show was my first experience with the phenomenon. Each episode always had a strange robot or monster that Voltron would cut in half by the end of the story with his energy sword. The problem was that, due to the language barrier, I was always vague on how the story added up. The character motivations, the history, the feuds—much of what I couldn’t figure out I had to make up. There was a love-story angle in the series, but I saw the show so irregularly that I don’t know where theirs ended and mine began. What I do know is that the cobbled-together story I came up with on that night went much further than any episode I had ever seen. The show had an elegant princess. She was beautiful and always in pink. Because this was, from my perspective, an Arabic cartoon, I wondered: where were these blonde and blue-eyed Arabian women whom this character was based on? And animation style aside, why did she look so much like Princess Peach from Nintendo’s Mario games? She was the focus of a love triangle with two of the robot cat riders, but it was clear to me that she and the black cat rider were meant to be together—she was the princess of the castle, and he controlled the central cat of Voltron. Voltron might be able to get by without his blue cat arm, or red cat leg, but there was no Voltron without the black cat body and head, so by my laws of heroic ranking, these two were meant for each other. But being the strong, silent, honorable hero that he was, Black Cat Rider never declared his love out of respect for his teammate. Ultimately, Princess Pink and Blue Cat Rider got married, a scene that was more bittersweet than any I had witnessed in all my years of watching The Bold and Beautiful. But right after the vows were made, there was an attack. In my little niche on the bed, I shifted back and forth from my side to my stomach to hide my miming the laser guns shooting and swords being constructed out of photon energy. Doing this helped me live out the action and chaos as the heroic Black Cat Rider grabbed the hand of the groom while the ground was blasted away underneath him. But then, something terribly unexpected happened: Black Cat Rider lost his grip; he let go. The groom, in either his suit or his blue rider uniform, fell to his death in tragic, slow-motion Bollywood fashion. I was mortified at what I’d imagined. I thought for a moment that I should go back and redo it all, but that death had been too melodramatically perfect to not be the real story. I needed to know what was going to happen next, and so I went on. The failed hero began to question himself. He couldn’t help but wonder whether, out of jealousy, a part of himself had let his partner fall. He went from being the strong, silent type to the dark, self-loathing hero who didn’t trust his feelings with anyone. None of his teammates understood enough to get through to him. Only the princess knew the truth, but because their love had always been undeclared, she was afraid changing that now would only push him further away. This was not good. The bedtime story that was meant to put me to sleep had now opened itself into a tragic, action-packed romance of epic proportion. I started to feel pressured. I had never before constructed stories that did not have happy endings, but these two had become so estranged from each other that a quick fix was far from possible. Yet it was getting very late, and as fired up as I was, I knew realistically that I couldn’t stay awake until morning in order to repair the damage I had done to these two. All I could do was continue the story toward its natural end, which would hopefully happen soon. It didn’t. Black Cat Rider (BCR) and Princess Pink just grew further and further apart. BCR continued to lead the Voltron team successfully, but to him it was never enough to make up for his failure. Conversations with the princess were always short, to the point, and painful. Much later—three years for them, or another 45 minutes for me—she tested the waters by saying something flirtatious for him to respond to. I was excited that this was finally going to happen. Again, however, it didn’t; in his depression, the fool blew her off. I was beginning to resent his stubbornness. I felt terrible for the princess, but at the same time who was I to reprimand BCR’s idiocy after what he had been through? It hurt Princes Pink every time she tried and failed to spark a relationship with him, and she soon began to wonder whether it was immoral for her to try. But she was a princess after all, a real lady. And so as much as it pained her to keep her composure through all this, she never cried, not even once. The same however, could not be said for me. I began to whimper. I was struck with a sudden awareness. I awoke suddenly to a reality of a humming AC and my mum calling my name out of concern. I didn’t know whether she had already been awake or had woken up suddenly because of my moan. Frightfully I worked to take the whimper out of my voice. I was glad that it was too dark for her to see my tears. I’m also grateful to my mother being either too groggy to follow up or receptive to my assurances that I was fine. Anything and everything that prevented her from turning on the light so that the whole family could see that I was crying at 2:00 a.m. What was I supposed to say to everyone if that had happened? That I didn’t have a nightmare because I wasn’t even asleep, that I wasn’t really sad but was crying because of an imagined tragic romance between two characters from an Arabic cartoon with fighting robot cats? I turned over after that and decided that it had been too close a call and I needed to force myself asleep. But I still couldn’t, not without having some kind of ending. So I wrapped it up, the way Charles Dickens did when he rewrote the false ending to Great Expectations for readers who could not handle the real one. The two lovebirds, BCR and Princess Pink, met under somewhat coincidental circumstances after saving the universe, and though there was still love and pain between them, they were able to enjoy their friendship and company. Reluctantly, I let the story go and fell asleep. I never followed up from where I last saw them to see whether they actually got together and made it work or not. Most likely that story ended where I left it. Either that or I was much too afraid of the consequences of finding out. I didn’t watch much Voltron when we got back to Oman, either. In truth, it’s quite possible that I avoided the show altogether so that my own version could stay real. This is great, and as an American viewer of English episodes, I never knew what was going on either.